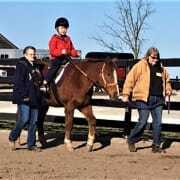 Therapeion Therapeutic Riding Center offers equine assisted programs to persons with disabilities of all ages. No experience is required! Volunteer opportunities include working directly with our riders and/or horses during class times, equine care, and more. A four hour training class is required before volunteering with our riders and horses. Please contact ttrcvolunteer@yahoo.com to register for a class! Preregistration is required. The minimum age to volunteer is 14 years old. Our therapeutic riding classes are on Tuesday, Wednesday, and Thursday and run between 3:45pm and 7pm. Our hippotherapy classes are on Monday through Thursday mornings, starting at 8:45am and running untill noon. Training is provided. All volunteers much complete our four hour New Volunteer Orientation class.